The Irish National Sailing & Powerboat School will run a series of yachting programmes on a trial basis from Malahide in County Dublin this year. The schedule will include the introductory RYA Start Yachting Course, the 5-day RYA Competent Crew Course and the RYA Day Skipper, for aspiring skippers. Course will run from Malahide Marina, where we are also running a schedule of Irish Sailing Powerboat Programmes. The expansion from Dun Laoghaire has been facilitated by the recent addition of the Elan 36, Dreamcatcher to the yacht training fleet and builds upon a significant increase in demand for this type of training. The Irish National Sailing & Powerboat School is Ireland’s largest sailing and powerboat training provider and has operated out of Dun Laoghaire Harbour for 40 years. 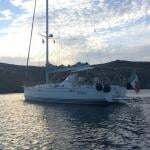 RYA Cruising Courses, including Start Yachting, Competent Crew, Day Skipper, Coastal Skipper and Yachtmaster are conducted on board the school fleet of training yachts. In addition to this training, the school runs a busy programme of adult introductory dinghy, yacht and powerboat courses, as well as children’s sailing course throughout school holidays and at weekends during the school year. Sunshine on Saturday greeted the groups of sailors taking part in the first of the 420 sailing introduction days. Groups of six sailors used the class association training boats to get their first taste of sailing in these Irish Sailing Performance Pathway boats. Sailors had the option of two hour sessions in either the morning or afternoon, both sessions coached by experienced 420 sailors who took sailors through the basics of boat set up and handling. Sailors from Malahide Yacht Club, Howth Yacht Club, Greystones Sailing Club and the National Yacht Club took part in this first introductory day. The next introductory day will also be held at Malahide Yacht Club on Saturday the 14th October, a small number of places are still available for this second day and any sailors wishing to attend should email [email protected] to make enquires on availability. #RNLI - Howth RNLI launched its all-weather and inshore lifeboats yesterday (Monday 1 May) to reports of a sailing yacht with steering failure at the entrance to Malahide Estuary. The inshore lifeboat was first on scene and located the casualty vessel just after noon. The 30ft sailing yacht, with five people aboard, was experiencing steering problems and unable to safely manoeuvre. Weather conditions at the time had a moderate sea state in Force 4-5 winds. The all-weather lifeboat arrived on scene shortly after and secured a towline to the stricken yacht before towing it to the safety of Howth Marina. Both the inshore and all-weather lifeboats returned to station and were stood down following the successful rescue. Speaking after the callout, Howth RNLI duty coxswain Ian Sheridan said: “We were delighted to assist the five crew of the sailing yacht after they found themselves with no steering at the entrance to Malahide Marina. #RNLI - Skerries RNLI responded yesterday afternoon (Saturday 28 May) to reports of a motorboat adrift with engine difficulties some four miles east of Malahide Estuary. Skerries RNLI volunteers launched the lifeboat shortly before 2pm when Dublin Coast Guard tasked them to assist the boat, with four men on board, that was experiencing engine trouble. Those on board the casualty vessel was able to provide the coastguard with GPS co-ordinates for their position. As a result the lifeboat, with volunteer Joe May at the helm and crewed by Steven Johnson and Laura Boylan, were able to proceed directly to the vessel. The motorboat was then taken under tow by the lifeboat and returned safely to Howth. Conditions at the time were clam with a slight sea fog. Speaking after the callout, Skerries RNLI lifeboat operations manager Gerry Canning said: "Everyone on board was wearing a lifejacket and they were able to give us their exact location. Even the most prepared can encounter difficulties at sea. "We would just like remind people that if they are in difficulty or see others who may be in difficulty to dial 999 and ask for the coastguard." Skerries RNLI is currently on the lookout for new volunteers to join its 18-strong crew, as previously reported on Afloat.ie. An Afloat.ie and Dun Laoghaire Marina appeal led Gardai to a yacht 'stolen' in North Wales last week being found in a north Dublin estuary. The yacht was found within hours of the Afloat.ie story being published last Friday in Malahide, one of Ireland's most popular boating inlets. Gardai have confirmed the yacht in question, a 38-foot ketch named 'Fram', has been recovered. It has been seized by Gardai and secured for technical examination a Malahide Marina. 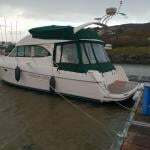 Gardai are investigating the theft and looking at local CCTV to see how and when the Vindo 38, long keel ketch came across the Irish Sea from Holyhead Marina. Following an Afloat.ie report it is understood an eagle eyed reader spotted the yacht, with white hull and varnished topsides, recently moored in Malahide estuary. The reader noted it appeared very similar to the boat originally featured in social media by Dun Laoghaire Marina. Anyone with information about the craft is asked to make contact with Malahide Garda Station. #toppers – Malahide Yacht Club hosted its first ever Topper regatta – the Traveller No.1 event - on Sunday 28th June with three back-to-back races for 40 competitors in fresh, blustery westerly winds on the Broadmeadow Water. For the majority of the competitors, it was their first time to compete at the North County Dublin venue and they enjoyed the flat water and non-tidal conditions over courses set by Race Officer Brian McDowell. In the 31-boat full rig fleet, honours went to Luke McIlwaine (NYC/CLYC) who posted three firsts to finish 5 points ahead of nearest rival Ellen McCarlie (County Antrim YC) who won the 1st Girl trophy as well. Third place went to Shane O'Brien of Howth YC. In the 4.2 fleet, with nine entries, Dan McGaughey (Donaghadee SC) with two firsts and a second topped the leaderboard just one point ahead of Erin McIlwaine (NYC/CLYC). "We were delighted to host the event for the Topper Class," said MYC Commodore Graham Smith, "and pleased that our facilities, race management and general organisation met with approval of the competitors and their parents." #MarineWildlife - The Dublin People has a heartwarming story of kind Malahide locals looking out for a lone seal pup earlier this month. The little one was found by swimmer David Tuite sitting alone on a rock at Low Rock near the north Co Dublin town, and "seemed totally relaxed and unbothered". Nevertheless, Tuite got on the phone and was connected with Seal Rescue Ireland, who assured him that the juvenile was just fine - a useful reminder to people not to get too involved if they seen any marine wildlife they think might be in distress. The Dublin People has more on the story HERE. #fingal – The Government's recent move to create a framework for the direct election of a new all-powerful Mayor for Dublin was expected to be a shoo-in. The new Super-Mayor's authority would incorporate the current four local councils of Dun Laoghaire-Rathdown, South Dublin, Dublin City, and Fingal, each one of which had to vote in favour. But Fingal's councillors voted firmly against it, despite emphatic support of the proposal by the councillors in the other three areas. As a Fingallion by adoption, W M Nixon strongly supports this independent move by a largely rural and coastal region which has a longer shoreline than all the other Dublin areas put together, and is clearly not a naturally integral part of the city. Fingal is the Ukraine of Leinster, and the glowering monster of Dublin is the Russia within Ireland, intent on the conquest of its smaller freedom-seeking neighbour. Vigorous, all-powerful, intensely urban, and distinctly impressed with itself, Dublin is certain that the further its bounds are spread, the better it will be for all its citizens. And the more citizens it can claim, then the better for Dublin. But Fingal is different. For sure, it can seem a bit sleepy and rural by comparison with central Dublin, but that's the way we like it. It's a place of odd little ports and much fishing, a region of offshore islands, rocky coasts and many beaches on one side, and the profound heart of the fertile country on the other. A place where – as you move north within it - you might make a living in many ways at once, taking in growing vegetables, raising animals, running a dairy herd, and keeping a lobster boat down at the local quay, while perhaps having a horse or two as well. And if you feel like more shore sport, the golfing options are truly world class. As for the sailing and all other forms of recreational boating, Fingal is not just a place of remarkable variety – it's a universe. With five islands – six if you count Rockabill – its 88 kilometre coastline is one for sport, relaxation and exploration. Sea angling is well up the agenda, and it's a kayakers' paradise, while Irish speed records in sailboarding and kite-surfing have been established in the natural sand-girt canal which forms for much of the tidal cycle in the outer Baldoyle estuary immediately west of Howth. Apart from fishing boats – and inshore they're usually only the smaller ones – it has no commercial traffic. And though there are tidal streams, in southern Fingal's main racing area between Ireland's Eye and Lambay, they're not excessively strong, and run in a reasonably clear-defined way, while the flukey winds which so often bedevil Dublin Bay away to the south are much less of a problem in sailing off Fingal, where the winds blow free. The range of boat and sailing clubs of Fingal matches the variety of its coast. The most southerly is Sutton Dinghy Club, rare among Ireland's yacht clubs in being south-facing. It may be focused on sailing in Dublin Bay, but scratch any SDC sailor, and you'll find a Fingallion. Round the corner of the Baily – not a headland to be trifled with - Howth has two clubs, the yacht club with its own marina, and Cumann na Bhad Binn Eadair (the Howth Sailing & Boat Club) in the northeast corner of the harbour, while Howth Sea Angling Club with its large premises on the West Pier is one of the tops in the country. The sunny south. Sutton Dinghy Club is Fingal's most southerly sailing club, and is also rare in Ireland through being south facing. As for the waters they share, their most immediate neighbour is the steep island of Ireland's Eye with its pleasant southwest-facing beach, the island itself a remarkable wild nesting site, particularly when you remember that it's close beside an intensely urban setting. When a discerning visitor described Ireland's Eye as "an astonishing and perfect miniature St Kilda", he wasn't exaggerating. Across in Malahide, where we find Fingal's other marina, Malahide YC - which recently celebrated its Golden Jubilee and currently has Graham Smith as its first second-generation Commodore – is in the curious position of having two clubhouses. One is a charming and hospitable place among trees within easy stroll of the marina, while the other is west of the long railway embankment which retains the extensive inner waters of Broadmeadow. This makes the waters into a marvellous recreational amenity and boating and sailing nursery, so not surprisingly it is home to active sailing schools. And it is also the base of Malahide YC "west", a dinghy sailing club on the Broadmeadow shore at Yellow Walls, while further west of it again is yet another club, the more recently formed Swords Sailing & Boating Club. The map of modern Fingal shows how the southwest corner of the present region seems remote from the largely coastal and rural nature of much of the rest of the county. And it also confirms the surprise (to many) that the Phoenix Park is in Fingal. North from Malahide, and you're into "Fingal profonde", its deeply rural nature occasionally emphasised by the sea nearby. The long Rogerstown Estuary, the next inlet after Malahide, sometimes found itself providing the northern boundary of The Pale, and as recently as the early 1800s the river at Rogerstown and the tiny port of Rush were a veritable nest of smugglers, privateers and occasionally pirates, with buccaneering captains of myth and legend such as Luke Ryan and James Mathews proving to have been real people who were pillars of society when back home in their secretive little communities after their lengthy business forays to God know where. The Rogerstown Estuary went through an unpleasant period when its inner waters were dominated by the nearby presence of the biggest waste dump in Dublin, Balleally Landfill. It rose and rose, but now it's closed, and is in process of being revived to some sort of natural state. The result is that the vista westward from Rogerstown is much improved by a pleasant and completely new hill which so enhances the view at sunset that shrewd locals have built themselves a row of fine new houses facing west, along the quirkily named Spout Lane which runs inland from the estuary. Whatever about the legality-pushing privateer skippers who used Rogerstown Estuary as their base in days of yore, these days it's home to the quay and storehouse which serves the ferry to Lambay, which is Fingal's only inhabited island when there are no bird wardens resident on Rockabill, and it's also the setting for another south-facing club, Rush SC. It is spiritual home these days to the historic 17ft Mermaid Class (they still occasionally build new ones in an old mill nearby), but despite the very strong tidal streams where the estuary narrows as it meets the sea, RSC also has a large cruiser fleet whose moorings are so tide-rode that unless there's a boat on the buoy, it tends to disappear under water in the final urge of the flood. This can make things distinctly interesting for strangers arriving in and hoping to borrow a mooring while avoiding getting fouled in those moorings already submerged. Not surprisingly, with their boat sizes becoming larger like everywhere else, Rush SC find that their bigger cruisers use Malahide Marina. To seaward of Rogerstown, with the little port of Rush just round the corner, the view is dominated by Lambay. A fine big island with is own little "miniature Dun Laoghaire" to provide a harbour on its west side, it has a notable Lutyens house set among the trees. But for many years now Lambay has been a major Nature Reserve, so landing is banned, though anchorage is available in its three or four bays provided you don't interfere with the wildlife along the shore. This makes it off bounds to kayakers who might hope for a leg stretch on land, though it's still well worth paddling round close inshore. Along the Fingal mainland coast, the next inlet after Rush is Loughshinny, a lovely natural harbour with a quay to further improve the bay's shelter. There's a very active little fishing fleet, while the shoreside architecture is, how shall we say, decidedly eclectic and individualistic? Go there and you'll see what I mean. Six miles offshore, Rockabill marks the northeast limits of Fingal. It's a fine big double-rock, with a substantial lighthouse and characterful keepers' houses attached. But as it's now automated, the only time Rockabill is inhabited is for the four summer months when a bird warden or two take up residence to monitor the rocky island's most distinguished summer residents, Europe's largest breeding colony of roseate terns. In Fingal we tend to take these pretty but noisy summer visitors for granted, but the word is that south of Dublin Bay the tern buffs are so incensed by Rockabill having a clear run that they're tried to start a rival colony of roseate terns on the Muglins, and built a row of tern houses (one good tern deserves another) to facilitate their residence. The potential nest sites may not have survived the past severe winter. But in any case, one wonders if they had planning permission from Dun Laoghaire/Rathdown council for this development? Persons suggesting that such a development would almost certainly be terned down will not be given any attention whatsoever. Skerries and Balbriggan are the two main sea towns of north Fingal, and they're as different as can be, the difference being emphasised by historic rivalry. It's said that back in the government harbour-building days of the late 19th Century a grant was made available to assist local landowners to make significant improvements to one of the harbours, and this meant war. So eventually the grant was split with half going to improve Balbriggan, and the other half to Skerries, with neither being a total success. If you seek total shelter in either today, you have to be prepared to dry out, while the anchorage off Skerries is also subject to a large tidal whorl which means that when the ebb is running in a strong onshore wind, the moorings are doubly rough and diabolically uncomfortable. And every so often after an exceptional nor'easter, we have another litany of boats driven ashore and Skerries yacht insurance going even further through the roof. It's a situation which needs proper attention from an administration which is genuinely interested in the port. And the proper development of the harbour at Skerries, while retaining the little old place's special character, is surely something which could be much better done by Fingal Council rather than some remote Mayor of Dublin for whom Skerries will be the outermost periphery, a place seldom visited, if at all. We've seen it all before. Time was when Fingal was simply the North County, little noticed in the centres of power which were basically Dublin City and Dublin County, their head offices in the heart of the city. But then in 2001 the new four-council setup was created, and the old name of Fingal – never forgotten by those who cherished the area – was revived. A very fine new user-friendly County Hall – it has even been praised by Frank McDonald of The Irish Times – was built in the re-born county town of Swords. Out on the new boundaries meanwhile, the signs went up saying "Welcome to Fingal County". But we old Fingallion fogeys pointed out that as Fingal means "Territory of the Fair Strangers" (i.e the Norsemen rather than the Danes), it was superfluous to be describing it as "the county of the territory", so these days it's just Fingal, and we're happy with that. Here in Howth, we sort of slipped into acceptance of the new setup. Once upon a time, from 1917 to 1943, Howth had its own Urban District Council. It says much for the place's remoteness from the world that the HUDC was established in the midst of one global war, and quietly wound up in the midst of another. In 1943, Commissioners had to be imposed on the tiny fiefdom to offset the fact that some local interests thought the HUDC existed entirely for their own personal benefit. So at various times since, Howth was run either by Dublin County Council, or even by Dublin City Corporation. We were assured that this latter setup was all to our benefit, as the powers-that-be in City Hall had a soft spot for Howth, sure wasn't it the place where the mammy went every Thursday evening to buy the family's fish, and wouldn't she want to see it looking well? Maybe so, but when it came to doing something more useful with the harbour, Howth Yacht Club – having re-constituted itself in 1968 from an amalgamation of Howth Sailing Club (founded 1895) and Howth Motor Yacht Club (founded 1934) - found itself dealing with a bewildering variety of government departments as the lowly interests of fishing and its ports seemed to be shifted whenever possible by civil servants who reckoned that banging the drum on behalf of fisheries in particular, and maritime interests in general, was not a shrewd career move for anyone planning a steady progress up the very landbound Irish public service ladder to the sunlit uplands of a long and prosperous retirement. So if at times absolutely nothing seemed to be happening in a harbour which was painfully inadequate for expanding boating and fishing needs, it was partly because the club officers and fishermen's leaders could find it difficult to discern just who in authority could or would make the decisive call. In those days it turned out to be somewhere in the hidden recesses of the Office of Public Works. Suddenly, in 1979, a plan for the major re-development of the harbour was promulgated at official level, with a radical rationalisation planned for its future use. The western part, it was proposed, would become totally fisheries, while the eastern part was to be given over to recreational boating, all of it involving major civil engineering and harbour works projects. Looking at the successful harbour today, it all seems perfectly reasonable and sensible. But back in 1979 when HYC were presented with a time-limited take-it-or-leave-it choice, the way ahead was not at all clear. Friendships were sundered and family feuds emerged from the heated progress towards accepting the offer that the club agree to vacate its premises on the West Pier - a clubhouse which it had renovated and extended only ten years earlier – and commit itself to the installation, at members' cost, of a marina in the eastern harbour with the obligation to build a completely new clubhouse there. It's all history now, but it was done. And done so well by those involved that today it's simply taken for granted. Arguably, it's a compliment to those who created the Howth YC setup, that newer members should seldom wonder how it all came to happen, it just seems so right and natural. And as for those running the club, they in turn have to build on past achievements in dealing with an ever-changing administrative environment in which the changeover to being part of Fingal was only one of several evolutions. Yet the recent attempt to abolish Fingal was a wake-up call. In Howth we may have wandered into it, but in just a dozen years, a dormant Fingal identity has come quietly but strongly awake. In Howth village it's natural enough, as our backs are turned to Dublin and we look to the rest of Fingal. But even on the south side of the hill, where fine houses face across Dublin Bay and you'd expect a sense of identity with households in similarly choice locations for all that they look north out of Dun Laoghaire, you find that the attraction of visiting the southside has the exotic appeal of going foreign, while those of us more humbly placed in the village, if visiting remote places like Rathmines or Terenure, find it positively unnerving to think of all the houses between us and the sea. Then too, while Fingal Council has been establishing itself in our hearts and minds, it has been a good time for Howth Harbour. Good fences have been making good neighbours, and though marine administration in government has been kicked from pillar to post, an underlying Department of Fisheries recognition that their harbours cannot be only about fishing has led to a re-think on the use of buildings about the harbour, with Howth becoming an extraordinary nexus of good seafood restaurants, such that on a summer evening, despite the presence of a traditional fish and chip shop, the seafood aroma is of a proper fishing port in Brittany or Galicia. In fact, rents from the hospitality and sailing and marine industries in Howth have now reached such a level that fish landing fees – formerly the bedrock of the harbour economy – only contribute about 10% of the overall income. As for how we've been getting on with our new masters in County Hall up in Swords, the news is good. Most recently, we've been having direct contact with the current Mayor of Fingal, Kieran Dennison, who hit just the right note when he officially opened the J/24 Worlds in Howth in August 2013. Following that, he was back at the annual Commodore's Lunch in HYC in the dark days of November when a review of the past season lightens the onset of winter, and he was able to tell us that thanks to contacts made at the Worlds, his invitation to visit the America's Cup in San Francisco in September was made even more enjoyable. Those of us who reckoned the only way to visit the 34th America's Cup was on the television screen were reassured by the thought that if somebody was going to represent us in the San Francisco bear-pit, then our Mayor, our very own Mayor of Fingal, was just the man for the job. So we very much want to keep Fingal in existence and in robust good health, but we appreciate that its current boundaries might be creating a bit of a Ukraine-versus-Russia situation. In particular, the southwest of the county could well be Fingal's Crimea and Donetsk regions. There, relatively new settlements of ethnic Dubs in places like Clonsilla, Castleknock, Blanchardstown could become such a source of trouble that it might be better to transfer them peacefully to administration by either Dublin city or South Dublin before there is unnecessary bloodshed. The situation arises because, when the boundaries were being drawn, southwest Fingal was set out all the way down to the Liffey. The Fingallion instinct would be to see the border drawn along the Tolka, in other words the M3. But there could be trouble because of the discovery – always something of a surprise – that the Phoenix Park is in Fingal. I could see that when some people find our Fingal includes the Park, they'll want to fight for it, particularly as, in the southeast of the county, the excellent St Anne's Park in Raheny was somehow allowed to slip into Dublin City. One thing which is definitely not for transfer is the Airport. It is naturally, utterly and totally part of Fingal. For sure, it contributes a fifth of the county's annual income from business rates, making Fingal the economically healthiest Irish county. But we in Fingal have to live with the airport very much in our midst. If Dublin really wants to take over the airport, then a first condition before negotiations even begin would be that all flight paths are to be re-routed directly over Dun Laoghaire and Dalkey. A few weeks of that would soon soften their cough. Whatever, the recent kerfuffle about Fingal rejecting involvement in administration by an all-powerful Mayor of Dublin has been a powerful stimulant to thinking about how our own county might best be run. Everyone will have their own pet local projects, and most of us will reckon that decision-making in Swords, rather than in some vast and impenetrable office in the middle of Dublin, will be the best way to bring it about. For those of us who go afloat, the fact that Fingal Council shows that it cherishes its long and varied sea coast, rather than preferring to ignore it, is very encouraging. And the fact that this prospering county has some financial muscle all of its own gives us hope that we can build on what the past has taught us, and spread improved facilities to every port. Should that happen, it will in turn benefit Irish sailing and boating generally to a greater extent than would restricted development under one closely-controlled central administration headed by some southside megalomaniac.